As Daimlers have such an enthusiastic and knowledgeable following here, I proffer this 14/6/1958 shot of from left to right VV 8931, ACK 781, and ASD 834 at a day-trip to Wicksteeds Park, Kettering, standing by for their return trip. ACK 781 & ASD 834 were with Wesleys of Stoke Goldington and VV 8931 served then for Priory Coaches of Leamington Spa. I will leave it up to you chaps to come up with the original operators of the above vehicles. Oh! the ‘decker far left just out of shot is an ex-London Transport. STD 44, DLU 354, another Priory Coaches excursion bus. Wonderful photograph Victor! What is it about wartime Daimlers, and independents of this era? Maybe the "VV" is ex Northampton: it looks like a Park Royal body which were quite rare on Daimlers. ASD is Scottish is it not, but from where, I leave to the more knowledgeable. CK is probably Scout Motor Services, but not 100% sure. A wonderfully evocative picture of another "classic" independent, Wesleys, which I remember from reading "Buses Illustrated" when I was a lad! Wesley is probably best remembered for the Crellin-Duplex "half-decker" coaches it operated in the late 1950s. The two machines, KHO 178/179 had Mann Egerton bodywork on Crossley chassis and had been new to the Creamline group in Hampshire. 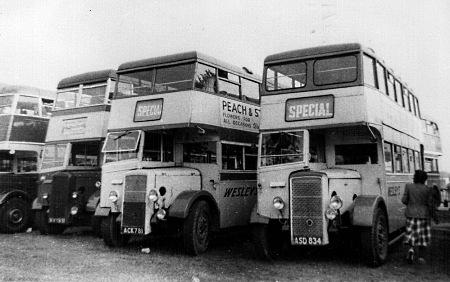 Several other independents (including Butter of Childs Ercall and Pegg of Caston) used half-deckers on schools services, but as far as I know Wesley was the only company to use them on stage carriage operations available to the public. Can anyone think of any other such operations by Crellin-Duplex vehicles? SD was a Glasgow registration, but of course that only narrows things down slightly! ASD 834 was new to Western S.M.T in 1945. It is a Daimler CWA6 with a lowbridge Duple body. SD was an Ayrshire mark. VV 8933 ex Northampton Corporation 124. A Daimler CWD6. Interesting that ASD 834 had a Duple utility body. Massey, at that time, was the only official builder of lowbridge utility bodies and London Transport used its influence and argument that its earlier CWA’s were bodied by Duple, to get its 1945 order changed to Duple, too. Not sure what you mean , Chris H, about Massey being the only builder of lowbridge utility bodies in 1945. There were several others. I have just been consulting the "bible" on utility buses, namely Alan Townsin`s book, which details the quantity and type block allocation system for the production of utility buses. Lowbridge CWA6 were all bodied by Duple or Brush, unless I have missed something, and I can find no reference to lowbridge Massey bodies on any Daimler utility chassis. Indeed, they were rare on Guys also. I think the ACK registered bus in Victor’’s photograph is a Brush body if anyone can confirm, and, of course, Southend had several. Duple built a handful of low bodies on early wartime Bristol K chassis, but most of these were built by Strachan. It would be fascinating to see the timings of all the combinations in a tabulated form if anyone wants to help me research it. Western S.M.T had lowbridge bodies on Guy Arab II’s and Daimlers CW’s by Northern Counties, Roe, Duple, Massey, Brush and Weymann. Hants and Dorset had lowbridge bodies by Strachan, Duple, Brush and Roe on Bristol and Guy chassis. Bradford Corporation Passenger Transport also received some Daimler CWA6s with Duple lowbridge bodies in January 1945. These were 487 to 501 (DKY 487 -501). However they were glad to dispose of them as there was no requirement for lowbridge buses in Bradford. They were never popular with the passengers due to the wooden seats which were a challenge on the upper deck. All these buses were gone by the end of February 1952 and some went to Nottingham for further use. Well, of course, you polymaths cracked my Daimler trio without delay. My puerile notes of the period give: ACK781 = Ribble fleet no. 2427, ASD834 = Western Scottish Motor Traction KR225 and VV8931 = Northampton Corporation # 126. Living fairly near Northampton, I recall my admiration of that all-Daimler fleet in respect of the impeccable cleanliness of their buses. I surmise that Northampton’s Transport Manager was a something of a martinet, in full charge of all he surveyed and probably ex-military……. I still perceive in 2011, that German- and Swiss-registered artics are always clean and dent-free as if they were followed by a valet service and a mobile bodyshop. Of the Euro-fleet, I opine that Albanian lorries are the dirtiest – and sadly, GB-reg HGVs frequently display Albion’s mud to the Eurohordes. Shame. I was at Wicksteed Park that day on the Monks Park Club childrens annual outing. The bus parked behind is a Northampton Corporation Daimler, end one of a row of four that took us over that day parked behind.